Cooper Industries Greengate® 1-Pole 3-Way Decorator dimmer wallstation has voltage rating of 120/277-Volt AC at 60-Hz. The integrated full-slide control of this wallstation allows easy, precise operation. 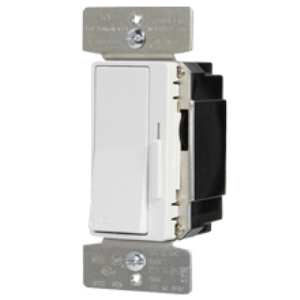 The 0 - 10-Volt DC dimming wallstation with back and side wiring, has white/ivory/almond faceplate. The adjustable high-level trim setting of this wallstation provides optimal lamp compatibility. It has maximum load capacity of 10-Amps, 1200-Watts at 120-Volt AC, 6-Amps at 277-Volts, 1600-Watts at 277-Volt AC. Wallstation operates at temperature range of -20 to 70 deg C. It is UL 94 V2 flammability rated to withstand harsh environmental conditions. Decorator dimmer wallstation is cULus listed.